The EpiPen is sold by the Pennsylvania-based pharmaceutical company Mylan. 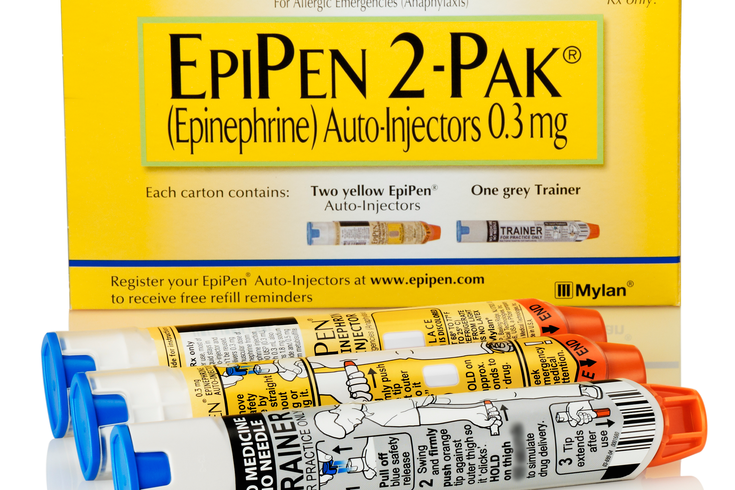 Customers nationwide are reporting a shortage in EpiPen brand epinephrine auto-injectors. More than 400 patients in 45 states reported difficulties trying to refill prescriptions of auto-injectors from the Pennsylvania-based pharmaceutical company Mylan, Bloomberg reported. Mylan allocates the EpiPen supply, but the global supply comes from a facility near St. Louis, Missouri, according to Reuters. Grocery and pharmacy chain Wegmans told Allergic Living there were “a handful of stores with a very limited inventory of the adult doses. But [branded and generic] adult doses are out of stock at our wholesaler and the other suppliers we utilize." On April 27 the chain received new product. Wegmans has 97 locations across the Mid-Atlantic states, including 17 in Pennsylvania and five in South Jersey. In September Mylan’s auto-injector producer, a division of Pfizer, was warned by the U.S. Food and Drug Administration because it failed to investigate hundreds of complaints about defective EpiPens, including cases when patients were hurt or died due to faulty injectors, according to Bloomberg. In March 2017 Mylan had to recall tens of thousands of injectors after complaints that some had not activated properly. EpiPen supply constraints have been reported in Canada and the U.K. because of manufacturing issues. This article was updated after it published.